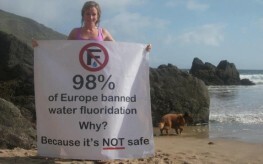 As more Americans become aware of the dangers of fluoridated water, and the fact that 97% of countries in Europe don’t fluoridate their water supply, communities are speaking out and changing the quality of municipal water supplies. Who would want to consume a toxic byproduct of the fertilizer and petroleum industries anyhow? Even with compelling evidence that water fluoridation lowers IQ scores and causes neurological impairment, as evidenced in multiple Harvard studies, the American Dental Association, our government agencies, and corporations want to keep dumbing down the next generation with fluoride. 1. Amherst County, Virginia – The citizens of Amherst can enjoy fluoride-free water now since several members of the Service Authority Board felt that there were no ‘optimum’ levels of fluoridation for water, and that it was an expensive and unnecessary additive to continue putting in municipal water. 2. Wellington, Florida – Council members listened to hours of debate from medical and dental experts, but the community’s heated comments helped to overturn a 14-year stint of water fluoridation. The majority of council members decided that no one should be forced to ingest any chemical added to a public water supply. Pro-fluoride dentists are trying to overturn the decision, but it holds for now, and citizens of Wellington can now enjoy unpolluted water. 3. Woodsville, Oregon – The Woodsville City Council wanted to add fluoride to the city’s drinking water, but after polling residents and finding out that 100% of respondents were against it, they changed their minds. Woodsville, Oregon, good going! 4. Sebastopol, California – City Councilors voted unanimously against fluoridation in Sonoma County due to the fact that fluoridated water can leach into ground water, causing contamination. This was a smart move since ‘acceptable’ levels of fluoride cannot be determined in many municipal water supplies, let alone water that seeps into the earth. 5. Bantry, Ireland – Town Councilors voted unanimously for an immediate end to fluoridation throughout Ireland, much because of a single woman’s education and activism. Last year, voters rejected water fluoridation in Wichita, Kansas, as well as Portland, Oregon, and Israel announced it will stop its mandatory water fluoridation program. If you want to stop water fluoridation in your city, ask council members to put it to vote, and have your friends speak up for their rights to clean water. Also defeated by Kansas’ most populace city – Wichita, KS in the year 2012. The ADA supports fluoride. There for they bless the use of fluoride by Hitler and Stalin.. Fluoride = dumb & docile!! Greedy babyboomers ……..REALLY? I think you would have to re examine this as it was the Matures that brought the fluoride idea back from Hitler WW2 Germany. Last time I looked GenXers were cruising along with the program.As far as Europe goes Ireland is the only place that fluoridated their water,the rest of Europe fluoridates their salt. “the rest of Europe fluoridates their salt” – wrong… only 6 European countries are foolish enough to do so and sales are a dismal failure. A poison remains a poison no matter who approves of it or what generation “has been” cruising with it. Greedy Babyboomers in big corporations, government, and the Amerikan Dental Association foisted this on the the next generation. How many babyboomers do you know with Autism and the plethora of neurological disorders? Sodium Fluoride added to municipal water supplies calcifies the pineal gland which regulates melatonin/serotonin levels, dumbs down the IQ by more than 15 points by age 6, causes bone cancer, and is the active ingredient in many pesticides. Goodness, look at the obesity trend among people age 25-55 in this country (especially people east of the Mississippi). I don’t remember seeing it close to this bad in the 1990’s. originally scheduled for its Feb. 26 meeting. Pedro NE on the state fairgrounds). fluoride to the water supply once again at a level of 0.7 PPM. We already know that Harvard University published an article showing that fluoride reduces IQ in children. Last month LANCET, one of the most respected medical journal in the world, published a report which adds FLUORIDE as one of six newly recognized “developmental neurotoxicants,” or chemicals that can cause damage to the central nervous system and the brain.